The Arab awakening is creating a new socio-political and economic reality in the region, transforming the balance of power, not because states have become stronger, but rather because states have become weak and fragile. 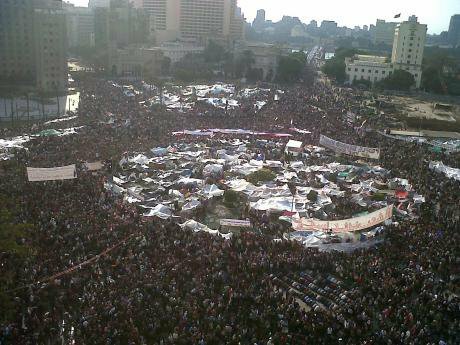 Tahrir Square during February 2011. Mona/wikicommons. Some rights reserved. After three years since the beginning of the Arab uprisings, the emerging political order in the Middle East is marked by considerable changes within each state at national level in a vital region in the global geostrategic configuration. The exceptionality of the Arab world has come to an end. The structures and balances of emerging powers in the late 1970s, mutating since the end of the Cold War, are being transformed. Since the Gulf War ended, security threats and tensions have increased among the states in the Middle East. Sometimes these tensions have resulted in a direct or indirect conflict threatening their socio-political and economic security. The threat of interstate aggression has manifested in new, more dangerous ways in the context of the Arab Spring, at a sub-state level, but with very important implications for regional stability and international security. In other words, the Middle East is undergoing the emergence of a new security order and regional reconfiguration. The Arab uprisings have unleashed internal dynamics of protest and political change in most of the states of the region, its impact transcending national systems, and affecting the political order in the Arab world. The region is at a crossroads, facing various security challenges both from neighbouring countries such as Israel, Turkey and Iran, and in their socioeconomic dynamics and national policies. Depending on the answers to these challenges, the result will range between everything from stability and regional cooperation, to disintegrative conflict in the Middle East. These transitions in the Arab countries have political, socioeconomic and geostrategic implications. They pose profound challenges. Within this new logic, the challenges that these states face can introduce several alternative versions of a new regional order, or the promotion of division by individual states may continue. In short, the common interest would be best served by developing an architecture of cooperative security to manage the latent threats and tensions in the region in this tumultuous transition, but to do so in a way very open to different evolutionary strategies. However, the behaviours of the current Arab states demonstrate their inability to offer such a unique common framework or paradigm in the situation in which the Middle East finds itself. - Rivalry between Saudi Arabia, Iran and Turkey spiralling downwards into a zero sum ​​game. The sum of these three trends will shape the geostrategic vision for the region in the years ahead. The political scene in the Arab awakening is dominated by the sociopolitical forces of the middle classes looking for a new socio-political system, one that is more just and free. Populations that undertook a peaceful struggle created a new model of change that involved the mobilization of populations through mass protests in the streets and the city neurological centres, headed by young people using the internet and social media as a new tool of political activism. They relied on the synergy of the masses to confront repression, and brought down the most entrenched authoritarian regimes in the region, Mubarak in Egypt and Ben Ali in Tunisia. Along with the spontaneous nature of the demonstrations, one of the most striking factors of the Arab Spring, is that there was no dominant political or organizational force. The old powers were trying to take back control of the situation without offering any new actors. The new distribution of power that emerged from this included the legalization of Islamist movements which were until then repressed and marginalized.Most important, the Arab Spring marks the end of Arab exceptionalism and proves that the Arab people are also able to initiate change and democratic transformation. The feeling Al shaab yurid (the people want) has spread across the region. The environment of hope and euphoria of the Arab uprisings has declined after the diversion of the Egyptian transition over three years. However, the orientation of the Tunisian transition has been quieter, facing the challenge of reaching a national consensus through the drafting of the constitution and the rule of the Al-Nahda Party. But the emergence of a new Salafist movement is a fundamental challenge to Tunisian civil society. After months of confrontation, fear and uncertainty, political assassinations and ideological polarization, the main actors of public life have managed to agree on a formula of coexistence, codified in a constitution that has been described as "the most liberal in the Arab world." It is proven that the Arab states which possess competent institutions and a considerable middle class, have the potential for a safer political transition without violence, tracing a peaceful revolutionary paradigm. Violence was not an element in the revolutionary imagination of the people. The masses confronted authoritarianism and repression by demanding “bread, freedom, social justice and dignity”. In this context, the monarchies of Morocco and Jordan introduced political and economic reforms, anticipating this popular discontent. But generally, the gradual decomposition of the old regimes and their inability to construct a new socio-political system for their societies, have opened the gate to the Islamization and radicalization of the population, becoming a real challenge for the state and Arab civil societies, which are proliferating the polarization between moderate and radical Islam. If we take Egypt as an example, "the greatest rivalry could be emerging between the Muslim Brotherhood and Salafists transnational networks driven by Saudi Wahhabis", with the total rejection by jihadist Salafism of democracy and its principles. However, from the perspective of a Jihadist Salafist, the Muslim Brotherhood in Egypt, and Al-Nahda Party in Tunisia, are a deviation from the straight path of Islam, its religious and socio-political thought. In Egypt, the Salafist movement remains strong. After years in prison, the Salafi jihadist groups continue to maintain strong links with Al-Qaeda and have obtained funding from the rich oil states. A significant example of the proliferation of terrorism is in the Sinai region, where the absence of central authority, the general feeling of marginalization and discrimination, and the lack of integration plans and structuring among its population, has radicalized the population, leading to the securitization of territorial-based politics in the Sinai Peninsula. This affects relations between Egypt and Israel in a way that could destabilize the rest of the region. The Libyan civil war is considered another paradigm, in which the Libyan people rose in an armed conflict against the Gaddafi regime that masked the fragility of a middle class without any civil society or state institutions. Libya is in a post-war scenario which nurtures two main threats. First, the emergence of radical Islamist groups, which both create instability and attempt to decentralize power away from state institutions, scattering it between different Islamist groups and the state. The second threat is the proliferation of arms trafficking, including the trafficking of advanced anti-aircraft rockets. After the fall of the Gaddafi regime, military bases passed into the hands of rebel fighters and Libyan mercenaries during a civil war that swiftly created a geopolitical tension zone. Weapons were supplied to the National Movement of Azawad, the Touareg Movement (in North of Mali) forming the National Movement for the Liberation of Azawad, Al Qaeda in the Islamic Maghreb and Al Ansar-Dine. These groups were able to extend their control and to form a black hole in the Sahel that causes instability and tensions among different international actors such as Mauritania and Morocco, Mali and Mauritania, Libya and Niger. Their influence also extends to the West African region. Gaza and Sinai were the first recipients of all kinds of light and heavy weapons as a direct result. The weak structure of the Libyan state after the civil war and the failure to rebuild their institutions, especially in the security sector, produced a vacuum which materializes also in continuous clashes and fighting in the capital. Therefore, the transformation to the new Libyan paradigm has created a weak state with fragile socio-political forces, which are opening the door to geopolitical chaos. The Syrian uprising began as a peaceful protest movement demanding political reforms and social justice and ended in a sectarian civil war, mainly instigated by the Assad regime using excessive force to suppress the popular uprising, which has spread throughout the country. The massive use of force by the government has led to the radicalization and militarization of the opposition. The confessionalization of the Syrian civil war has led to a circular conflict, based on the sectarian polarization between Sunni and Shia, between multiple fractions, groups and Katibas (combat units). The complexity of the Syrian conflict emanates from the logic of sectarian violence in the context of a proxy war of world powers (US and Russia) and regional powers (Turkey, Iran and Saudi Arabia), in fourth generation warfare (4GW) that repeats the Iraqi and Afghan scenario. Syria has become a geopolitical scenario for regional and international powers like Lebanon and Iraq. However, the Syrian regime has shown its strength in trying to regain control of the country. Probably, this country is entering a lost decade, with the slow decline of the regime, accompanied by the militarization of the opposition, the disintegration of public order and security. With thousands of deaths, millions of refugees, the wholesale destruction of industrial infrastructure and its historical patrimony, Syria is the main victim of this confrontation. It will take years to rebuild political and economic order and security. The geostrategic competition between Saudi Arabia and Iran has triggered power struggles throughout the Middle East (Iraq, Lebanon, Bahrain, and Syria) and converted the region into one geopolitical Great Game.This rivalry is manifest in several aspects. This rivalry between Saudi Arabia and Iran stems from a sectarian identity conflict arising from a time prior to Islam.In fact, the roots of the conflict date back to a rivalry between Arabs and Persians, which continues to this day. The sectarian issue sets a parameter to this rivalry between Riyadh and Tehran, with tensions between Sunnis and Shiites that give shape to this competition. The official Islamic belief of Saudi Arabia, Wahhabism, does not accept Shia Muslims as true believers. Religion is a neurological issue for both states that grant political and religious legitimacy in Riyadh and Tehran. This legitimacy is necessary for the concentration of power, for internal hegemony and is configured as an argument for their regional hegemonic aspirations. These two countries Saudi Arabia and Iran, both face strong internal challenges from a population increasingly divided and depressed. Given the importance for both states representing the religious factor, Islam is translated into terms of a competition for the leadership of the Umma, which lends legitimacy to a conflict characterised in zero-sum terms. The decomposition of the Iraqi regime as a regional power after the US invasion in 2003, was received by Riyadh and Tehran as an opportunity to extend its hegemony over the Gulf. Previously, Saddam Hussein had played a balance of regional powers game, but his defeat created a vacuum of power that has triggered these movements in the regional dynamics for successive decades. Saudi Arabia and Iran both try to fill this gap by operating beyond their own borders. In the post-Saddam period, Iran has provided financial and military support through Sepah-e Pasdaran (Iran’s Revolutionary Guard) groups and Shiite factions in Iraq. By contrast, the performance of Saudi Arabia in Iraq is more difficult to discern, often financing and supporting Iraqi Sunni groups. Iran is losing its influence and soft power in the Levant region as a consequence of the Arab Spring on account of its support for the Syrian regime, although in Lebanon it still has a strong position. The growing role of non-state actors such as Hezbollah in Lebanese politics, pose a serious challenge to Saudi Arabia. While Iran provided support for Hezbollah, when it made its appearance in the 1980s, Saudi Arabia is reluctant to offer support to the group, with its Shiite beliefs and close ties to Iran. Tensions between Hezbollah and the Council of the Gulf Cooperation are increasing with the Syrian civil war, caused by the participation of Hezbollah in the conflict with the Syrian army, supporting Assad to repress and massacre the Sunni majority. The Arab uprisings have also altered the systematic roles of Qatar and Turkey in the region. Both states abandoned their old pragmatic positions and proclaimed a new regional role after the Arab Spring. Qatar used its relations with the Muslim Brotherhood and the political and financial cooperation with Islamist parties that took power in some countries to strengthen its geopolitical position. Perhaps, Qatari hyperactivism is the biggest winner in the Arab Spring. Its Al Jazeera TV channel has played a significant role in the Arab revolts. In addition, its diplomacy was a key to pushing the Gulf Cooperation Council and the Arab League to take some measures on the Syrian crisis. Turkey also has emerged in this period as a power that creates balance between Arab countries, standing between Sunnis and Shiites. Turkey appears to have reached its limits. Ankara's power was clearly growing in the region before the Arab spring due largely to the foreign policy of 'zero problems'. This initiative was based on the expansion of Turkish influence in the region, playing a constructive role in regional conflicts. But Turkey's role in this region has changed after the uprisings. Its posture vis-à-vis Syria in particular has mutated through three phases, first as an ally of the regime, then mediator and lastly in opposition to sectarian violence against Syrian citizens. The Gulf Cooperation Council was shaken by the uprising in Bahrain and agitated into action and assertiveness. Bahrain is still an open wound and the most vulnerable part of the organization, but the Gulf Cooperation Council has demonstrated its military muscle and political ambitions with its intervention in Bahrain. The Council has reaffirmed its vocation to protect the monarchical status quo against the pro-democracy or pro-republics movements, rejecting any attempt by Iran to project its power in the zone. The rising ambitions of the Gulf Cooperation Council are reflected in the offer of membership to Jordan and Morocco, in order to promote a Sunni geostrategic alliance, mediating the transition in Yemen, supporting military intervention in Libya, and seeking greater unity within the Council. Israel remains a source of geostrategic threat to Arab security in various different dimensions. It is the neighbour who possesses nuclear weapons, creating serious military imbalance between Israel and the Arab states. The apparent absence of Israeli will to resolve the Palestinian issue, by establishing an independent Palestinian state according to UN resolutions and implement the roadmap also creates instability. But the Israeli-Palestinian conflict is losing some prominence in the actual geopolitics of a region confronted by all the other issues arising from the Arab Spring, issues that create greater concern among Arab states who appear much more focused on internal tremors and the national policies required to deal with them, than on this conflict. The Middle East before the Arab uprisings seemed like a heterogeneous security system. These parameters were inherited from the colonial powers and the Cold War. The Arab revolutions untied the internal dynamics of protest and political change in most of the states of the region, affecting the whole political order. There are three fundamental geostrategic implications shaping the future of the balance of power in the Middle East. The first geostrategic consequence of the Arab Spring is the appearance of people as the main catalyst for these nations' internal dynamics. The popular uprisings in the Arab world were caused by a combination of economic, political and social deficits. While there are similar conditions in several Arab countries, the responses of the regimes were dissimilar, creating different models of conflict. The results of citizen protest differ from state to state, depending on its ability to maintain its monopoly on the use of force, which in some cases has led to a democratic transition from the bottom up (Tunisia, Egypt, and Yemen). In other cases, the result is gradual reforms from the top down (Morocco, Jordan and the Gulf Cooperation Council). The third group of countries are countries with a government crackdown against the protesters or even a disintegration of the state (Libya, Syria). The second geostrategic consequence is the proliferation of weak states. First, the monopoly of force has been questioned and weakened in several Arab countries, with increasing violence at sub-state level. The new governments or those who managed to stay in power cannot reconcile themselves with their highly mobilized societies, and have failed to reach a national consensus to calm the sociopolitical upheavals. They also cannot reform and rebuild their security apparatus and they cannot regain control over the peripheral zones within their sovereign territories, especially in the Sahel region, the Sinai Peninsula and South of Yemen. The manipulation of sectarianism to achieve realistic geopolitical objectives, by Saudi Arabia and Iran, which may trigger a regional recoil effect. The strong divisions within the Sunni world, a particular example arising between Saudi Arabia and Qatar. Turkish power. The country has been regarded as an example of political and economic success in many countries. However, this does not translate into a Turkish domain or a neo-Ottoman order in the region. On the contrary, Turkey has lost some of its soft power in this scenario. However, it did exert influence through its relations with the Muslim Brotherhood, and may have a particularly strong influence on post-Assad Syria. Iran has possibly reached the limits of an expanding influence, and its ability to contribute constructively to the security of the region can be curtailed. Its nuclear program has added relevance to Iran, raising concerns among its Arab neighbours in the Gulf. The Arab Spring led indirectly to the weakening of Iran in the region as a result of civil war in Syria. The old geopolitical epicentres of the region (Cairo, Damascus and Baghdad) are experiencing complicated transitions (Egypt), civil war (Syria) and ethnic and sectarian division (Iraq, Lebanon and Syria). This has allowed the conservative monarchies of the Gulf, led by Saudi Arabia and Qatar to attempt to fill the geopolitical vacuum. On a systemic level, the Arab awakening is creating a new socio-political and economic reality in the region, transforming the balance of power, not because some states have become stronger, but rather because other states have become weaker and more fragile. ÜLGEN, S., et al., Emerging Order in the Middle East. Washington, D.C, Carnegie Endowment for International Peace, 2012. RÓZSA, E., Geo-Strategic Consequences of the Arab Spring. Barcelona, European Institute of the Mediterranean, 2013. SALLOUKH, B., “The Arab Uprisings and the Geopolitics of the Middle East”. Roma, The International Spectator. Italian Journal of International Affairs, 2013. ÜLGEN, S., op. cit, p 3. 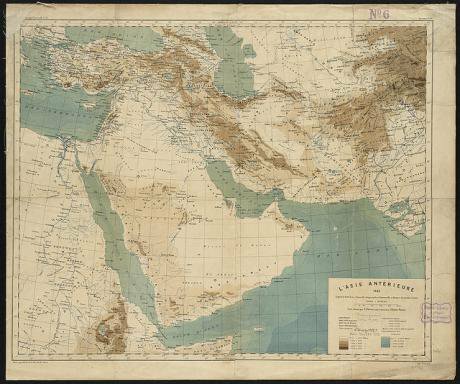 SALEM, P., The Middle East: Evolution of a Broken Regional Order. Washington, Carnegie Endowment for International Peace, D.C, 2008. RÓZSA, E., op. cit, p 11. YOUNGS, R., El nuevo viejo paradigma de seguridad en Oriente Medio. Madrid, FRIDE, 2013. MABON, S., “The Middle Eastern Great Game”. Zürich, ISN-ETH, International Relations and Security Network, 2013, p 2. MABON, S. op, cit. p 4. BRADLEY, J., “Iran’s Ethnic Tinderbox”. Washington D. C, the Washington Quarterly. Vol. 30, 2007. RÓZSA, E., op. cit, p. 18. DAVUTOĞLU, A., "Turkey’s zero-problems foreign policy." Washington, D.C Foreign Policy, 2010. BALOGH, I., “The Middle Eastern Balance of Power in 2012 And Its Implications for the Future” en ONDREJCSÁK, R., et al. Panorama of Global Security Environment. Bratislava. CENAA, 2012.